I need some better clothes, but I never seem to make the time to go shopping. So I just signed up for Stitch Fix, a service that picks out clothes for you (after you fill out a fit and style survey and specify what price range you're looking for) and sends them to you at regular intervals. You can try the clothes on at home, buy what you like, and easily send back anything you don't. The first box arrived yesterday, and I was stoked to see what I'd been sent and try everything on! In the box were five beautifully packed items, complete with a personalized note and suggestions on how to wear each piece. 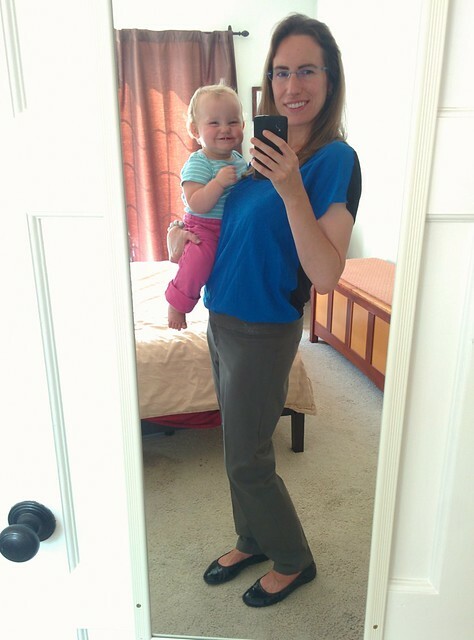 For this first shipment, Britta was my stylist, and she chose a skirt, a pair of jeans, two tops, and a blazer. 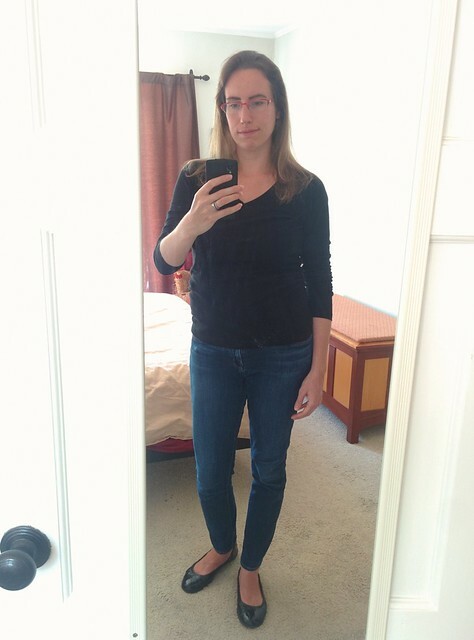 For reference, here's what I look like in my default outfit of jeans, a black t-shirt, black flats, and the red glasses I wear most of the time. I'm okay with dressing like this sometimes, but I'd like to raise the bar a little. On to the new clothes! I'm wearing it here with my favorite lightweight cocoon cardigan, a black cami, and the aforementioned black flats. 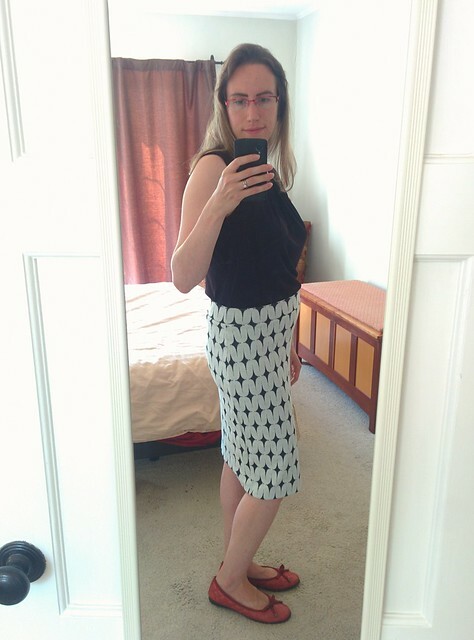 The description calls it a "printed" skirt, but I'm not sure why, because the pattern is definitely knitted into the fabric, which feels quite thick and substantial, yet lightweight. 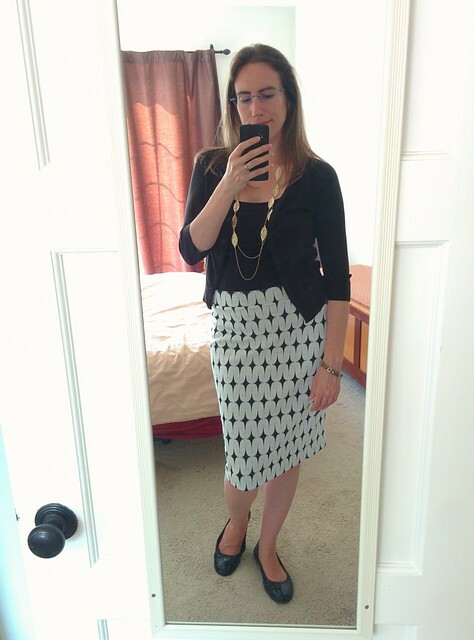 No zippers, no slits, no fuss, just a really comfortable and nice-looking knee-length skirt. 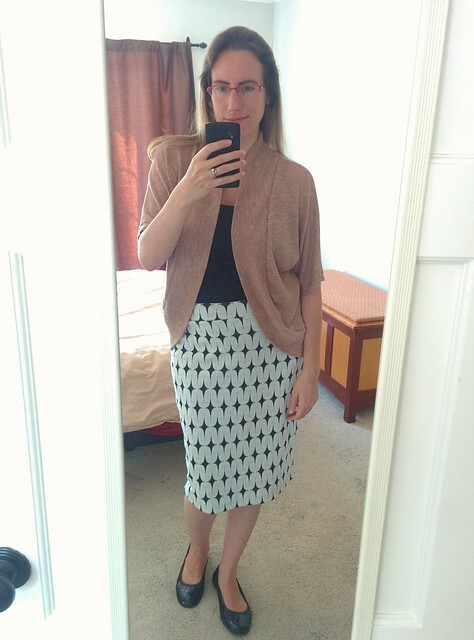 Okay, the skirt is a keeper. On to the jeans! These fit just right. 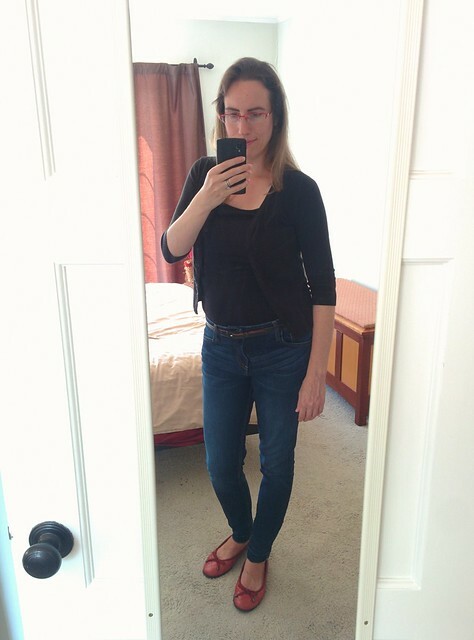 They're quite similar to my own jeans from the first photo, but it never hurts to have another pair of dark-wash skinny jeans, and these are softer and more comfortable than any I already owned. There's not a whole lot more to say about them. They're jeans; there's almost nothing in my closet that they won't go with. I'm wearing them with the red flats and black cami from before, a narrow black belt, and a little black cardigan from ModCloth that I've had for seven or eight years. The only thing about these jeans that I'm not sure I like is that they have a "released hem", which means that they were hemmed at one time and then the hem was ripped out. This, of course, is supposed to look cool, but on me I think it looks like I failed at hemming my pants. I'm not sure yet if I'm going to try to hem them again or just get used to the fact that this is The Style Now, but in the meantime, I trimmed off some of the more egregious loose threads. Please forgive the wrinkles in the top; that's how it came out of the box. It's made of two different fabrics: the front is a silky blue woven fabric, while the back is a black knit. 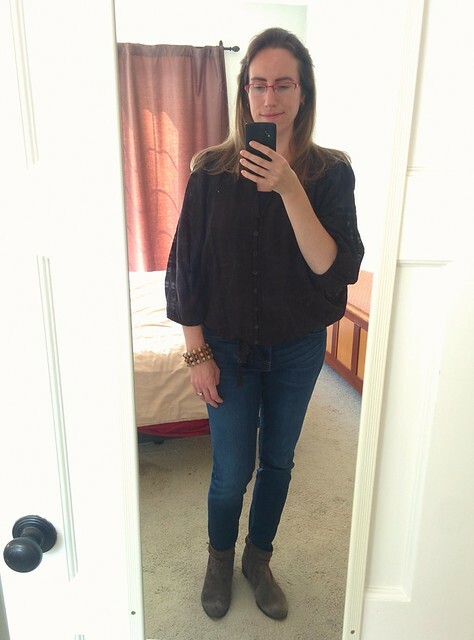 I'm wearing it here with the new jeans and some brown suede booties. 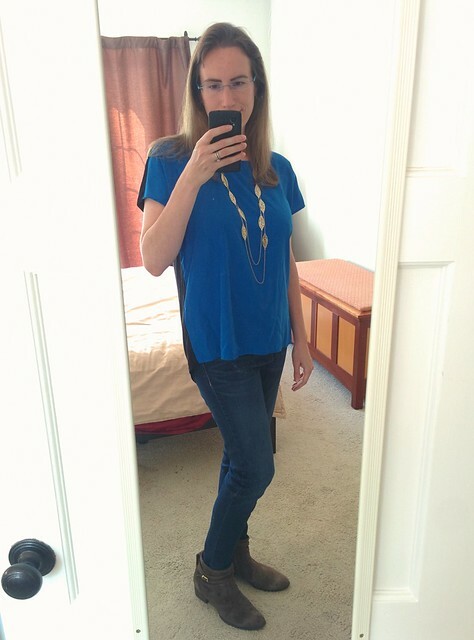 It seemed like something was necessary to break up the expanse of blue, so I put on a long gold necklace, which matches the gold buckles on the boots. I also swapped out my red glasses for a different pair, partly because I thought the red would clash with the blue, and partly because the red glasses have silver bits on the sides that would clash with the gold. The alternative glasses I'm wearing here aren't necessarily a great match for the top, either, but I wasn't sure what else to do. This is not a color I wear often! As you can see there, the hem of the top is longer in back than in the front. I wasn't sure if I should tuck it in or not, but decided that the shape of the hem was meant to be showing. 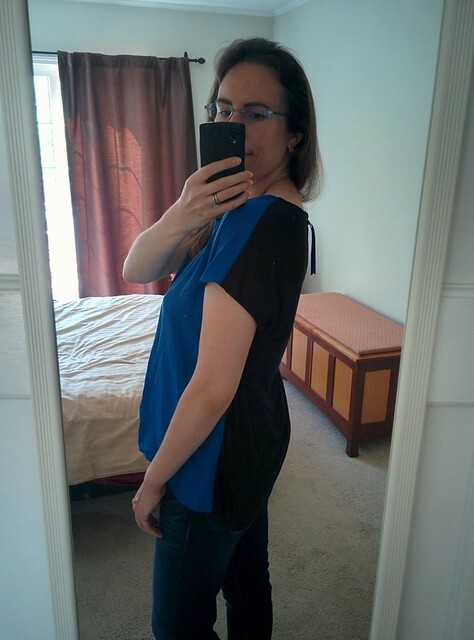 This seems like the kind of top that I should own -- I never seem to have any warm-weather tops that can be worn alone and are nicer than t-shirts -- but I'm not sure this particular style is for me, and I don't own very many things I can wear it with. The outfit suggestions were to pair it with white jeans or with a patterned skirt that picks up the blue color, and I don't have either of those in my closet. Can't win 'em all. Onward to the next item! This next top is also a bit adventurous for me, but in a way that I'm happier with. 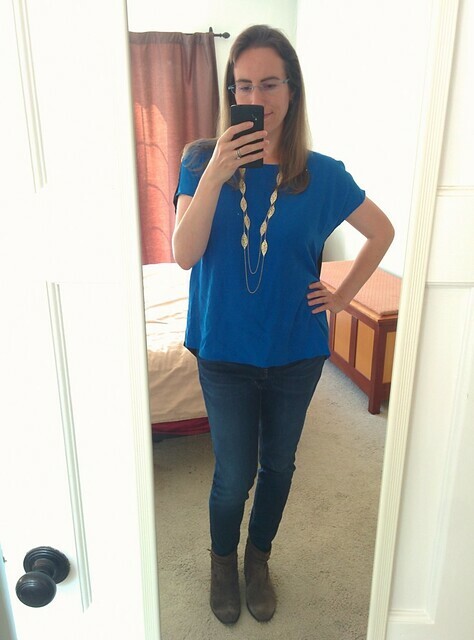 Above, I'm wearing it with the jeans and suede booties from the last couple photos, having swapped out the gold necklace in favor of my favorite stretchy wooden beaded bracelet. 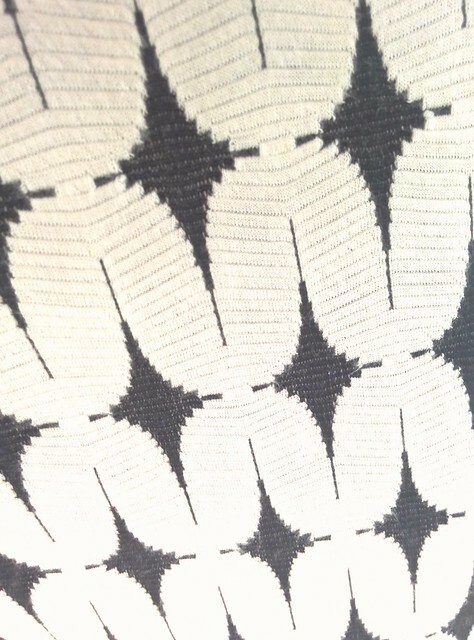 I really like the fabric of this top; it's a lightweight woven cotton with a lovely, subtle pattern. What makes it a departure from my usual style is the voluminous cut and poofy sleeves. It's gathered at the waist, though, so I don't feel like I'm wearing a potato sack. It's hard to tell in the pictures, but the fabric is slightly sheer, so I'm wearing the black cami under it. 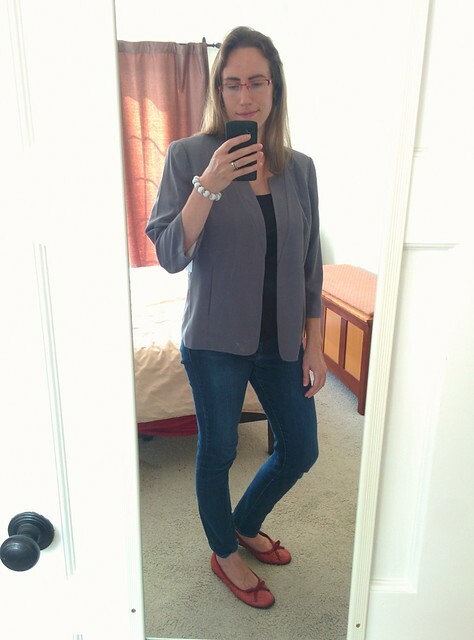 Because of the way this top is cut, I almost feel like I'm wearing a blazer (although it's light and airy), and that may have been what gave me the idea to try it with some dress pants. I got out the black flats again and replaced the wooden bracelet with one with white beads. 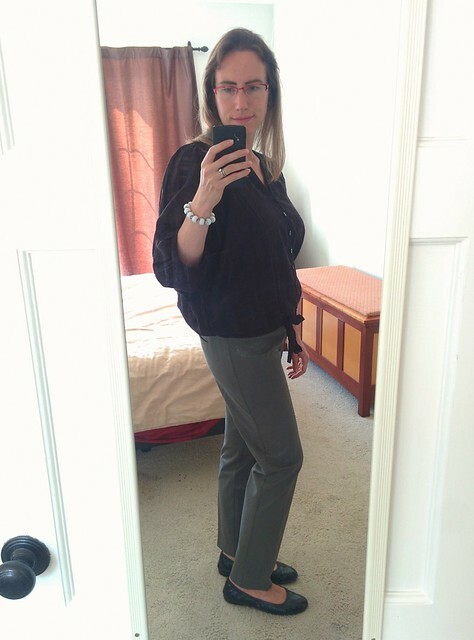 I thought this look was acceptable, but not great; I think this top really wants very slim-fitting pants to balance out its poofiness, and these pants aren't quite slim enough. In any case, I still like the top. 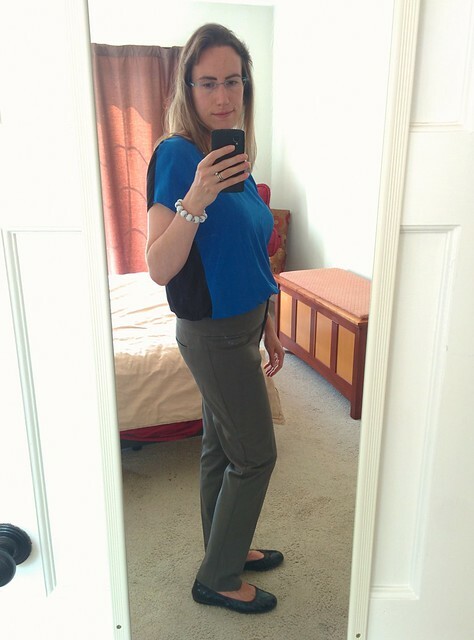 At this point, I decided to put on the blue top one more time to see if it'd look good tucked into these pants. The result was okay, but again, nothing to write home about, and it doesn't really feel like "me". But then my daughter jumped in, resulting in the picture that's by far the cutest of the whole set, my clothes notwithstanding. 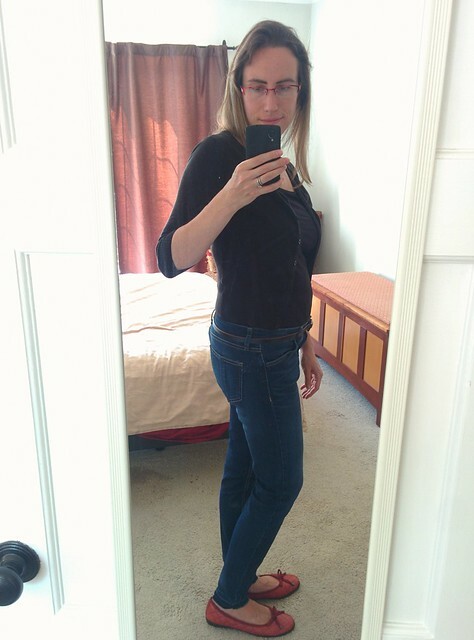 Here I'm wearing it with my old jeans from the first photo. I've also got the black cami, red shoes, and white bracelet from before. 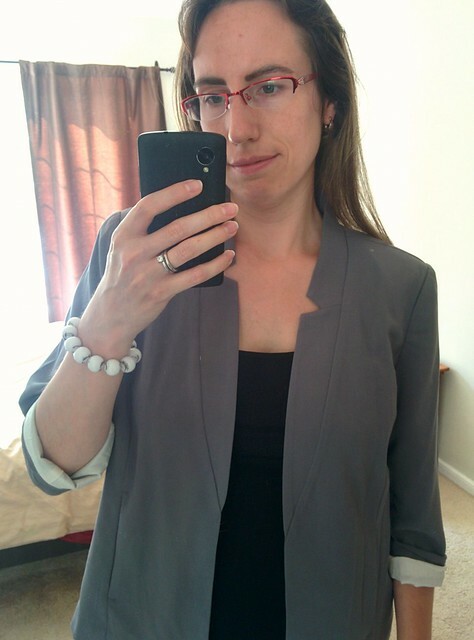 I like the three-quarter-length sleeves, and I like the color; the only other blazer I have right now is black, so it's good to have a lighter color. Even though the sleeves don't really need to be rolled, I liked rolling them to show off the lining, which has a subtle pattern woven into it that doesn't show up in the photos. 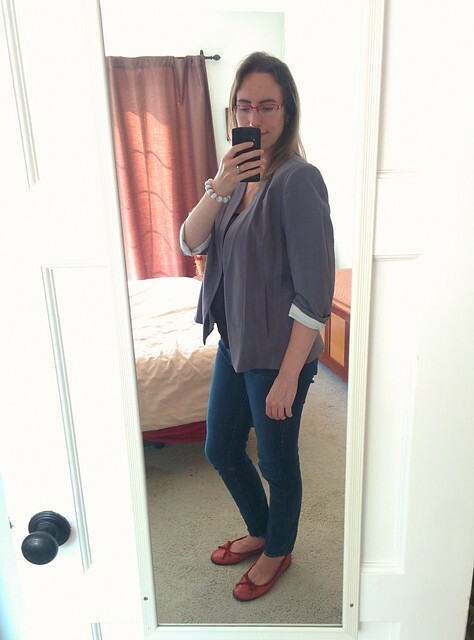 I also like that this blazer has vertical pockets that I can easily put my hands in. So I think I'm just supposed to leave them alone and hope that it looks intentional! This is a lot dressier of an outfit than I would wear to work under normal circumstances, but it seems like a good outfit to have on hand, just in case. 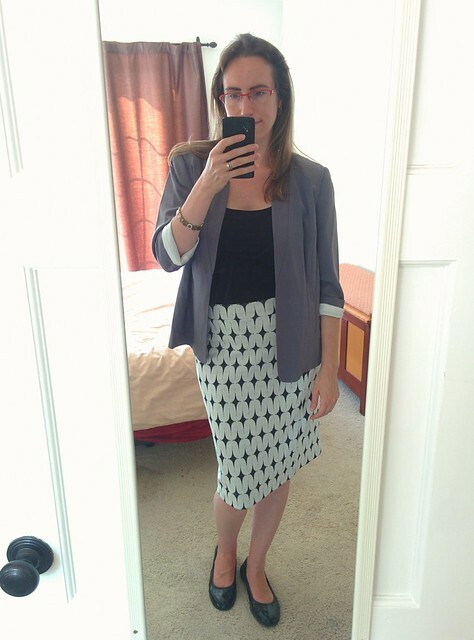 Finally, here's one last picture of the skirt with a bunch of my own previously pictured stuff, just because it's awesome and because I'm so pleased with how nicely it goes with things already in my closet. The verdict: I decided to keep everything Britta sent me! I probably wouldn't have kept the blue top, except that there's a 25% discount if you buy everything you're offered, which more than made up for the cost of the top, so it was actually a better deal to just keep it all. That's how they get you, I guess. 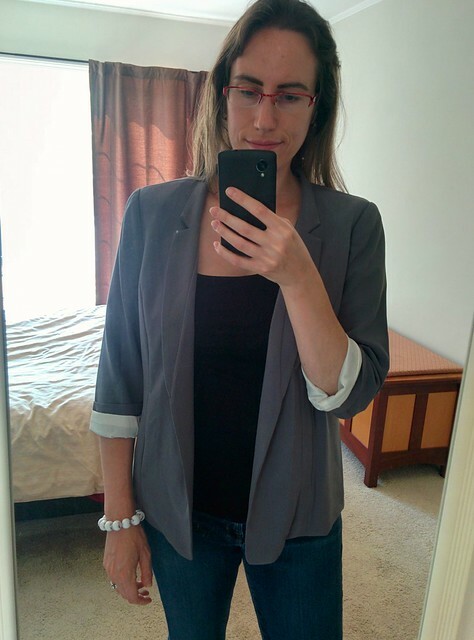 Overall, I'm feeling pretty satisfied with the Stitch Fix experience. I'm already looking forward to the next box! If you decide to give it a try, here's a handy referral link. Great photos! Thanks for the reviews! I have two friends who are engineers at StitchFix, so it's nice to know that besides being a good place to work (according to them), their offerings are also good! Maybe I'll even look and see what they have for short, fat femme guys. I was actually thinking that Stitch Fix could be great for someone who wants to experiment with non-gender-conforming clothes in the comfort of their own home, but yeah, there's a pretty hard binary. (Of course, that's the case in most of the rest of the fashion industry, too.) I would think that a Stitch Fix stylist would be able to pull stuff from both the men's and women's offerings if you asked them to, but I don't know. I should try an order from them again. I've tried 4 or 5 now with very mixed results (but enough good ones that I keep trying). Sometimes I get frustrated because I make really specific requests (specifically, wanting tops with structure rather than formless billowing, because I don't like that look on my shape) and they don't actually listen. It looks like they did great for you -- I really like the skirt and, actually, I really dig the blue top with your gold necklace! I sort of think that both the tops they gave me erred on the side of "formless billowing", but that may have to do with the fact that I specified my size for tops as "L". That would have been accurate (if not too small) if we were talking about, y'know, American Apparel t-shirt sizing, but now I'm thinking that for Stitch Fix I should specify "M" and see what happens.